Q: Watts link TSB still active 9 years later? Is the TSB07-006 Saleen/PJ watts link recall still active until all operational units are corrected? The PJ i just purchased a month ago has the Saleen OEM watts system. As per the TSB, Saleen is to pay for repair, parts and labor form a Ford dealer. I would rather they send me the amount involved and get a Whiteline system and keep the Saleen OEM watts in storage. I have a Cortex watts ($$$) link (bench mark of perfection) system that I have on my track run 14 Shelby. Totally stabilizes the rear end on turns. Especially high speed turns. I would prefer the Whiteline watts ($) since it is what the Saleen/George Folmer edition (see design) is using. I will not track the PJ. I doubt the TSB will be carried out for remaining vehicles. TSB parts may be scarce to nonexistent. The company that produced the 2007 PJ Edition, Saleen Incorporated, does not exist. The TSB equipment pack was basically a horizontal support bar for the rear frame rails and a new pivot bolt for the rear differential cover. Cost of parts are not equal to a complete WhiteLine system. You may try the fellas in Michigan to see if there are remaining TSB equipment kits in their warehouse. Cost should be nominal. If you desire a WhiteLine kit, purchase from your favorite vendor and be done with it. Thanks, I will look for a whiteline system. If you keep the Saleen watts link just replace the bolts. For the center pivot bolt and the link bars to pivot bolts I replaced them with grade 12.9 Allen bolts from www.belmetric.com. They are m14 x 2.0 x 60. Part # 14C60D122P. The center bolt has to be ground down a little to about 55mm because the diff cover hole isn't deep enough. The link to frame bracket bolts are a little longer: m14 x 2.0 x 80, part # 14C80D122PPK. Bel-metric offers the associated hardened washers and lock nuts too. Thank you 2007 for the bolt issues fix. However, an additional problem, according to the original Recall and TSB fix was installing a lateral support 'bar" to tie the two link locations on the chassis to each other sor additional support during high loads. It was determined that the extreme loads on the stamped uni-body channels where the Watts link brackets bolt to would not be strong enough. Similar to the components of the Whiteline, (Saleen/Follmer Edition or a Cortex Watts link, ect). My first choice is to put a current Watts link on mine and keep the Saleen one as a static conversation piece. Are you referring to the bar that is on the left border of my picture? It does connect the left and right sides but I was unaware that was a supplemental piece... Mine came with it. Difficult to tell 100% from the close up pic, but looks like the lateral support that was a portion of the recall " fix" has been installed on yours. Although I would not push the Saleen Watts (after fix) link very hard, it is probably ok for street use. A good Watts link has a center pivot bolt that is larger and still have additional pivot support from the diiff cover along with the upper lateral support bar. The (James) Watts link is over 200 years old and has been used in racing for decades. I am the 2nd owner of mine and it was in storage for years. I don't think it was driven much since 2011 . It has 5000 miles on it. FYI, I raced mine... Hard... At Barber Motorsports Park in Alabama last year and had no problems. One of our Australia members races his quite a bit too and was the one who told me about the bolt upgrade. To date no breaks or issues. I suppose for a dedicated track car it would be risky... But for the weekend warrior it seems to be fine. All that being said... I agree there are better built units like the Whiteline one. Looking for pics or specs to fabricate a support bar that will tie the two Watts link brackets to each other. Today's Saleen appears to care, but does not respond to email suggestions, and has no info on the TSB fix since they are the new Saleen and not the Famed Saleen of the past. Thank God it says Parnelli on it. Contact the Michigan warehouse for spare parts / TSB equipment. That would be Speedlabs, right? You are far more helpful than Saleen in this matter. Thank you, you solved my problem. Hi. This forum has been of infinite help to me in prepping my Saleen watts link for install, but I do have a few questions that I'm hoping you can answer. I was given a Saleen Watts link (black version, which I believe means the one from Techco), it included the support brace so it's a post TSB version. 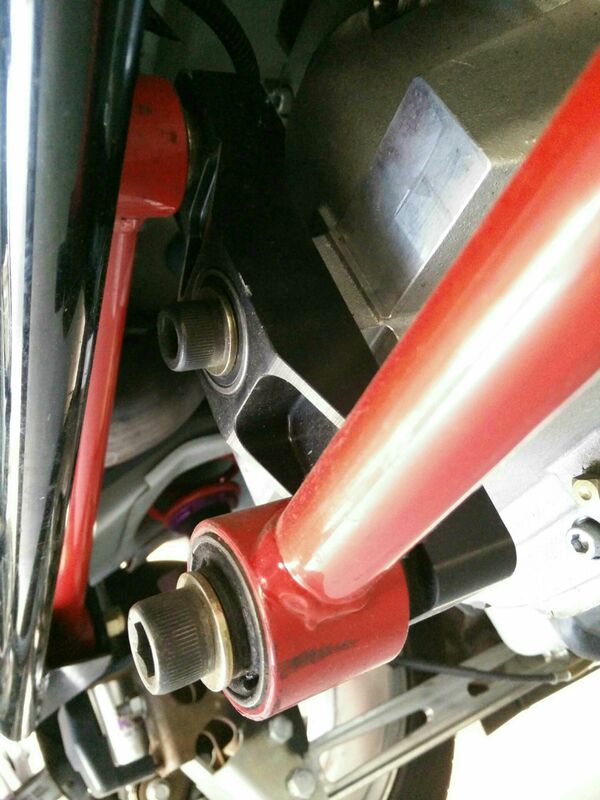 Thankfully the threads in the diff cover were undamaged so I was able to upgrade the hardware and install I installed this on a 2013 Mustang GT with a bunch of other suspension work. I did all of the suggested hardware changes you gave (your shopping list was excellent) but ran into two issues that I'm hoping you can shed light on. 1) with the bushing and sleeve in place, which *may* have resulted in it being slightly thicker than the OEM bushing/sleeve, the top arm to pivot bolt head was both hitting the link cross brace and rubbing on my spare tire well when the car was lifted or sitting on it's wheels. There was no adjusting around this so I went back to the grade 10.9 bolts for the arm to pivot attachment and the clearance issues went away. The hex cap 12.9 bolts just have a much thicker head and this could be an issue with the 13 body style. Not sure if there is anything I can do for this, and also not sure if it's worth worrying about as these bolts don't seem prone to failure unlike the pivot to diff cover bolt which is now a 12.9 hex cap bolt (as are all the bolts at the chassis to arm mount points). Did I do something wrong? Your image shows the brace and the 12.9 bolts at the arm-to-pivot point, did you not have a problem with them hitting the brace or tire tub? I might have the refreshed/TSB Gen 1 shorter arms as my car's pivot sits almost at 12/6 vs 1/7 with the newer arms. 2) With the stock 10.9 arm to pivot bolts, they do NOT stick out far enough on the backside of the pivot mount to thread the flange nut onto. The bolts are torqued to 120lb/ft to the pivot thread points, and I used brass tip set screws to anchor it, but should I source longer 10.9 bolts and replace them so that the flange nut can be installed on the back side of the pivot arm? I cannot see if you are using a nut on the back side in your pictures. The instructions call for a nut to be placed on the backside of the pivot where the arm attaches. I did drive the car home after install, almost 80 miles, and there were no clunks, bumps, noises, etc and the car felt far more planted and stable than it had been. I just want to shore up those two issues and make sure that I am operating safely. The car is primarily a street car with occasional autocross use. Thanks so much if you respond. If I understand your issue correctly. Your top pivot bolt is hitting your lateral cross brace due to a replacement bushing/sleeve that is too think. If that is the case, I would have mounted the bushing in a lathe and turned the sleeve down enough to fit properly. Since I am not using my PJ as a track car, I have done the TSB. My car has 5,800 miles on it and bushings are good. However, since the Watts link on this car has a single pivot bolt, I bought a Whiteline Watts link to have in the event I decide to track this one day. I have a 14 GT 500 with a Cortex Watts, but I track that one and the Cortex is one of the best ones out there. Only cost prevented me from getting a Cortex for the PJ. Cortex, $1,000.00. Whiteline, $800.00 ebay. Personally, I wouldn't track my PJ with the OEM watts. I push my equipment pretty hard on a track.The track will find the weak link. Hi. If I use the 12.9 hex cap style bolts suggested by a member above on the arm-to-pivot spots it was rubbing the tire well if the car was sitting on the wheels, and rubbing the cross brace of the watts system when lifted off the wheels. When I switched back to the OEM included 10.9 bolt with a regular bolt head that issue resolved. I am running Energy Suspension direct replacement bushings, and after looking at more photos I'm not sure that they are adding any significant thickness in what is being bolted on, definitely not enough that it would explain why I can't get flange nuts on the backside of the pivot arms. The instructions specify that a flange nut should be put on the backside of the pivot block where each arm bolts on, and it should be torqued to 120lb/ft. I do not have any exposed threads on the backside of the pivot block, and don't think I would even if I had the stock bushings. I used 60mm long bolts as did the user above with the upgraded hardware. The bolts torqued to spec into the pivot block and I used brass tipped set screws to secure them. Are there supposed to be flange nuts on the backside of the pivot block on the arm connecting bolts or not? If so, I can just get longer bolts and make it happen, i'm just not sure why mine are not fitting. I also have a crapload of suspension mods on the car including adjustable upper and lower control arms, as well as FRPP K springs which lowered me at least an inch so the clearance issue on the aftermarket bolt could also be impacted by that to some extent, though I do feel it would have hit even on stock suspension as it traveled through the suspension's range of motion over bumps. Again, that is only with the 12.9 hex cap bolt upgrade in place, the stock bolts are having zero clearance issues. Just talked to JDM engineering and chatted with a tech who remembered the kit. He said I should have the nuts. He told me that with the factory hardware there were not many threads to grab onto, and if my bushings made it any thicker that would explain why I can't. He told me to just grab a slightly longer bolt, get those nuts on the backside, and I should be in good shape provided I already upgraded all the other hardware and bushings. Can't say enough about how well you all documented the issues, repairs, tips, and upgrades that can be done to make one of these Watts work. I know in time I will probably jump to a Whiteline or Cortex, but since it was free and I was able to install it, I figure for now it's better than my questionable PHB setup and it has also resolved some phantom clunks that I had going on in the rear end due to said PHB.